Earn up to 18,000 reward points. An unassuming tone machine, loaded with reverb, and made to make your pedal board shine. The Morgan SW22R 22W tube guitar head, with reverb, is wolf in sheep's clothing. This 6V6-driven amplifier was based around the super-clean platform originally found in a certain $40,000 amplifier. 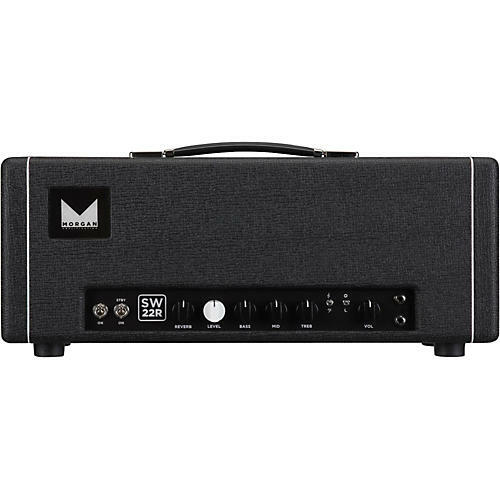 This amp produces a sweet, singing sustain, even on clean notes. Intentionally designed to be the loudest and cleanest it could be with two 6v6s, it is still capable of producing a warm, compressed natural overdrive that may have you turning off your favorite boosts. Should you decide to leave your boosts on, the SW22R will handle them with ease. Designed with the modern pedal board-driven guitarist in mind, the SW22R excels with all drives, boosts, delays and anything else you want to put in front of it. The SW22R utilizes a special level control. Its job is to control the amount of gain available in the power section of the amplifier. You will notice after about 3 o'clock on the level control you are adding overdrive to the power section. This allows you to use the level control at lower volumes without sacrificing your tone.